One piece molded heavy walled tanks designed to withstand rugged service. Ideal for handling acids and caustics. Resin complies with U.S. Food and Drug Administration regulation 21 CFR 177.1520 (c) 3.1 and 3.2. 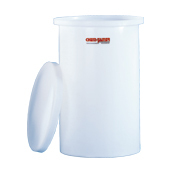 Click here for Cylindrical tank covers.